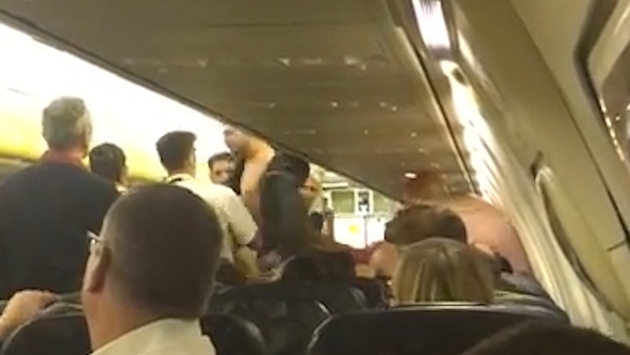 A video has recently surfaced of a massive fight that broke out during a Ryanair flight which forced the captain to call for an emergency landing. According to The Sun, the Ryanair plane—a low-cost airline based out of Ireland—was en route from Brussels, Belgium, to Malta when an elderly woman was allegedly struck in the head, causing a massive argument between several men on the flight. After yelling at each other, the men came to blows and a massive fight broke out during the flight, causing the pilot to call for an emergency landing in Pisa, Italy. Besides punching each other, one of the Ryanair flight attendants was also slapped in the face. After members of the flight crew and other passengers pulled the men apart and stopped the fight, the pilot announced the emergency landing. Once the plane landed safely in Italy, authorities boarded the flight and arrested the passengers for disrupting the journey.